Some twelve years ago, I stood watching my university students file into the classroom for our first session in the Theology of Faith. That was the day I first saw Tommy. He was combing his long flaxen hair, which hung six inches below his shoulders. It was the first time I had ever seen a boy with hair that long. I guess it was just coming into fashion then. I know in my mind that it isn't what's on your head but what's in it that counts; but on that day. I was unprepared and my emotions flipped. I immediately filed Tommy under "S" for strange... Very strange. Tommy turned out to be the "atheist in residence" in my Theology of Faith course. He constantly objected to, smirked at, or whined about the possibility of an unconditionally loving Father/God. We lived with each other in relative peace for one semester, although I admit he was for me at times a serious pain in the back pew. When he came up at the end of the course to turn in his final exam, he asked in a cynical tone, "Do you think I'll ever find God?" I decided instantly on a little shock therapy. "No!" I said very emphatically. "Why not," he responded, "I thought that was the product you were pushing." I let him get five steps from the classroom door and then I called out, "Tommy! I don't think you'll ever find Him, but I am absolutely certain that He will find you!" He shrugged a little and left my class and my life. I felt slightly disappointed at the thought that he had missed my clever line -- He will find you! At least I thought it was clever. Later I heard that Tommy had graduated, and I was duly grateful. Then a sad report came. I heard that Tommy had terminal cancer. Before I could search him out, he came to see me. When he walked into my office, his body was very badly wasted and the long hair had all fallen out as a result of chemotherapy. But his eyes were bright and his voice was firm, for the first time, I believe. "Tommy, I've thought about you so often; I hear you are sick," I blurted out. "But what I really came to see you about," Tom said, "is something you said to me on the last day of class." (He remembered!) He continued, "I asked you if you thought I would ever find God and you said, 'No!' which surprised me. Then you said, 'But He will find you.â€™ I thought about that a lot, even though my search for God was hardly intense at that time. (My clever line. He thought about that a lot!) "But when the doctors removed a lump from my groin and told me that it was malignant, that's when I got serious about locating God. And when the malignancy spread into my vital organs, I really began banging bloody fists against the bronze doors of heaven. But God did not come out. In fact, nothing happened. Did you ever try anything for a long time with great effort and with no success? You get psychologically glutted, fed up with trying. And then you quit. But it would be almost equally sad to go through life and leave this world without ever telling those you loved that you had loved them. "So, I began with the hardest one, my Dad. He was reading the newspaper when I approached him. "Dad." "Yes, what?" he asked without lowering the newspaper. "Dad, I would like to talk with you." "Well, talk.â€ "I mean. It's really important." The newspaper came down three slow inches. "What is it?" "Dad, I love you, I just wanted you to know that." Tom smiled at me and said it with obvious satisfaction, as though he felt a warm and secret joy flowing inside of him. "The newspaper fluttered to the floor. Then my father did two things I could never remember him ever doing before. He cried and he hugged me. We talked all night, even though he had to go to work the next morning." â€œIt felt so good to be close to my father, to see his tears, to feel his hug, to hear him say that he loved me." "It was easier with my mother and little brother. They cried with me, too, and we hugged each other, and started saying real nice things to each other. We shared the things we had been keeping secret for so many years." "I was only sorry about one thing --- that I had waited so long." "Here I was, just beginning to open up to all the people I had actually been close to..
"Then, one day I turned around and God was there. "He didn't come to me when I pleaded with Him. I guess I was like an animal trainer holding out a hoop, 'C'mon, jump through. C'mon, I'll give you three days, three weeks." Apparently God does things in His own way and at His own hour. "But the important thing is that He was there. He found me! You were right. He found me even after I stopped looking for Him." "Tommy," I practically gasped, "I think you are saying something very important and much more universal than you realize. To me, at least, you are saying that the surest way to find God is not to make Him a private possession, a problem solver, or an instant consolation in time of need, but rather by opening to love..
You know, the Apostle John said that. He said: 'God is love, and anyone who lives in love is living with God and God is living in him. "Oooh.. I was ready for you, but I don't know if I'm ready for your class." "Tom, think about it. If and when you are ready, give me a call." In a few days Tom called, said he was ready for the class, that he wanted to do that for God and for me. So we scheduled a date. However, he never made it. He had another appointment, far more important than the one with me and my class. Of course, his life was not really ended by his death, only changed. He made the great step from faith into vision. He found a life far more beautiful than the eye of man has ever seen or the ear of man has ever heard or the mind of man has ever imagined. Before he died, we talked one last time. "I'm not going to make it to your class," he said. "I know, Tom." "Will you tell them for me? Will you ... tell the whole world for me?" I will, Tom. I'll tell them. I'll do my best." So, to all of you who have been kind enough to read this simple story about God's love, thank you for listening. And to you, Tommy, somewhere in the sunlit, verdant hills of heaven --- I told them, Tommy, as best I could. If this story means anything to you, please pass it on to a friend or two. It is a true story and is not enhanced for publicity purposes. On my last day in Kenya, we were able to go visit the David Sheldrick Wildlife Orphanage near Nairobi which rescues orphaned baby elephants, and raises them until they are able to be reintroduced back into the wild with a family of adult elephants. Most of these elephants lost their mother when killed by illegal poaching. They are kept until about 5 years of age when they can be introduced back into the wild. I didn't realize elephants have hair! If you look closely, you can see a dust cloud over his back. He just sprayed himself with dust in order to keep the flies from biting him. Good trick! If you travel northeast from downtown Nairobi on Mogira Road and turn right at Happyland Distributors onto Juja Road, you will pass the Pangani Police Station. Just past that is St. Polycarp Anglican Church. This last Sunday St. Polycarp Church was not in any way "Happyland." As a result of a blinding explosion, one child has already died and eight more were critically injured. Not even the proximity of the police station deterred the attackers. A bomb went off at 10:30 am, while Sunday School children where memorizing Bible verses and learning a new chorus. Already police have confirmed that the IED was placed there earlier and then detonated remotely. The blast critically injured eight children and killed one. Security forces have said that there is evidence that the attack is linked to al Shabaab, a radical group out of Somalia that is linked with al Qaeda. A few minutes after I got word of the attack I received text messages both from Joel Waweru Mwangi the Bishop of Nairobi and Archbishop Wabukala. Both said that they were heartbroken. 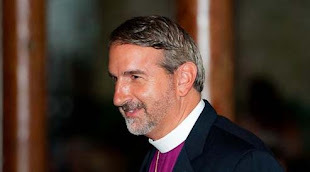 But both, and the people they lead in the Anglican Church in Kenya are resolute. The Gospel stands firm. During the week before, the Anglican Church of Kenya (ACK) bishops met for a retreat led by Bishops John Guernsey and Foley Beach, and Glen and Debbie Peta. All the bishops agreed it had been the best meeting that the House of Bishops had ever had. With Bible teaching and small groups, Bishops prayed for each other and called each other to life. There were prayers for physical healing and testimonies about how God had moved. There is something quite profound about a group Bishops singing, sharing, and praying, warmly embracing as brothers of common vision and faith. The fellowship of the Bishops spilled over into the Provincial Synod meetings on Thursday. Archbishop Wabukala recapped the teaching from the retreat and asked me to pray to invite the power of the Holy Spirit to fall on the leaders of the Province and send us out. On Friday I was able to spend the day with Bishop Joel and his wife. We visited projects and an orphanage, having a day that could only be described as sweet. To have the deep and satisfying week of retreat and ministry torn by the explosion at St. Polycarp is heartbreaking, but it has not (and will not) defeat the Church. But we have this treasure in clay jars, so that the extraordinary power15 belongs to God and does not come from us. 8 We are experiencing trouble on every side,16 but are not crushed; we are perplexed,17 but not driven to despair; 9 we are persecuted, but not abandoned;18 we are knocked down,19 but not destroyed, 10 always carrying around in our body the death of Jesus,20 so that the life of Jesus may also be made visible21 in our body. One might well ask what will now happen in Kenya. To understand that, it is important to know what happened when violence broke out after the last presidential election. When word surfaced that there was fighting and bands of mostly young people were going around killing people with machetes, then Bishop (now Archbishop) Wabukala went to the radio station in Bungoma, his home. For hour after hour he sat in front of the microphone reading Scripture and praying. His leadership was so effective, his was the only area of Kenya to escape violence. Now as Archbishop, he has taken that same spirit to other leaders and helped the best of Kenya to surface. Shortly after the attack, he was joined by Kenyan Muslim Secretary General Sheikh Adan Wachu as they jointly decried the attack and called for peace as the way forward. 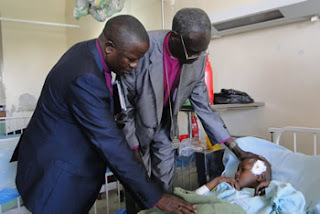 Bishop Joel of Nairobi and the Archbishop visited the Eastleigh Hospital where the injured children were being treated. They prayed for the children and encouraged their parents. In the aftermath of senseless violence, it is hard to imagine any more substantive voices than these two bishops. For me, this is much more personal than news clips on TV. Because it is close to my heart, it is all the more painful. But you can be sure of this: The purveyors of violence will not win in Kenya. The nation will not descend into chaos. In the face of unspeakable darkness, the Light is unmistakable. The journey may be difficult and painful, but the Kingdom of Jesus will prevail. The Lord will sustain us even in challenging circumstances. That is the promise of His Word, and for that, we give thanks.